BUFF-IT is a unique blend of nonionic surfactant and buffers designed to protect and enhance the performance of a wide range of agricultural products. BUFF-IT buffers spray water into pH range 4 – 5 which helps prevent sensitive agrichemicals from breaking down or being deactivated. BUFF-IT has a balanced buffer system which does not allow the pH to go below pH 4 (unlike comparable products). The built-in indicator changes from very faint orangeyellow to a brighter pink / red as pH drops below 5. The wetting agent (nonionic surfactant) in BUFF-IT helps retention of spray droplets on plant surfaces and spreading of droplets across the surfaces. 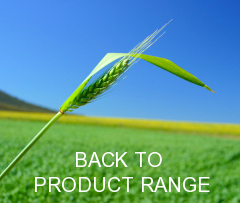 Retention and spreading enable more of the active ingredient to be available for uptake into the target. Buff-It Spray Adjuvant is a buffering agent to reduce the pH of spray water to the optimum range for alkaline sensitive products. Contains an indicator dye which changes colour when the correct pH is obtained. Also contains non-ionic surfactants to increase droplet capture and spreading on the target surface. BUFF-IT will control the pH of spray water into a narrow pH range near 4.5 regardless of the pH or hardness of the water used. 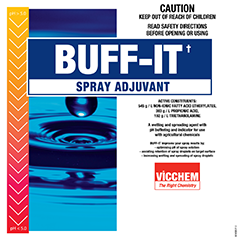 BUFF-IT has been shown to increase the efficacy of Glyphosate in neutral pH spray water (pH 7) and to be particularly effective in high pH water (pH 9). BUFF-IT was also found to be more effective than some other buffer or acidifier products that are recommended for use with Glyphosate. BUFF-IT can be used wherever a wetting agent is recommended and is particularly suited to situations where both wetting and pH control are required. BUFF-IT is generally soft on plants and beneficials. It has been found to have low potential for adverse effects such as leaf burn. BUFF-IT has been screened for phytotoxicity against a range of sensitive plants (grapes, lettuce, apples & tomatoes) and beneficials (Parasitic wasp Trichogramma carverae, Green lacewing Mallada signatus & Predatory Mite Typhlodromus Occidentalis. Whilst many adjuvant products can cause significant harm, BUFF-IT has been found to be one of the softest wetting agent or buffer products available and hence can be used with confidence in a wide range of situations. We would always recommend that when using BUFF-IT in a new or sensitive situation, test by application to a small area before using it on a full-scale basis. BUFF-IT is not recommended for use over or nearby waterways.